The point is, two Strangers, Amy and Mimi, took it upon themselves to commit various copyright infringements and other illegal acts for which Matt will most definitely sue them and they created something the kids are calling "The Twice Up The Barrel Once Down The Side Book Club" on Goodreads. Apparently you can join this and recommend books to each other and yell at each other about The Kite Runner and gossip about how my clothes are too small for my growing body. Did I explain that correctly? Someone do a better job in the comments. So you can join or check the group out by clicking HERE. In other news, you may have heard that last night was Halloween. I told you not long ago that it is my life-long wish to live in one of those neighborhoods from movies in the 90s where every house is decorated festively and thousands of children dressed in non-specific traditional Halloween costumes politely skip door-to-door to collect their bounty. Now picture that scene from WALL-E where the robot is moving through burning piles of garbage on a desolate land and periodically reminding you that you are lard-face who doesn't deserve this planet. That's what my neighborhood looked like last Halloween. Last time I had like six kids stop by. And I was heart-broken over this. But I wasn't deterred. And neither was Mr. Doodle, who has been looking more and more lately like he wishes he had never been rescued. 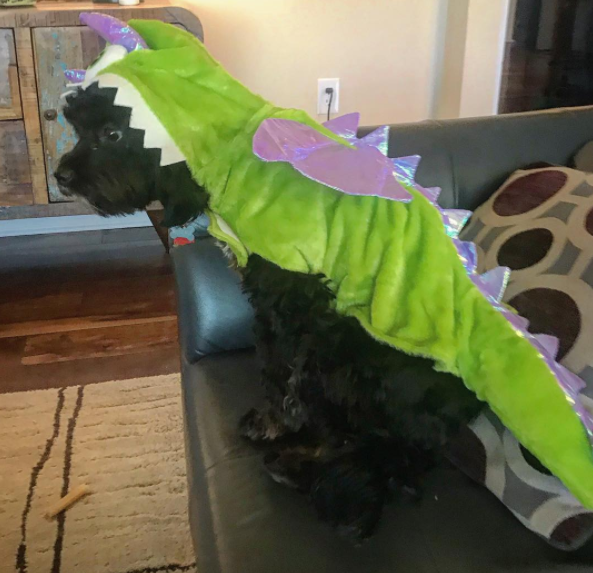 He voluntarily dressed up as a dragon. I talked with Lynne about the holiday and she informed me that she would be coming over with a bag of candy and we would both just pass out candy from my house. She came and we each carved a pumpkin and put some lights up so the kids would know we were in business. My friend Kate came, too, bringing with her the largest bottle of beer I have ever seen in my life. She had to hold it with both hands. And she sipped it all night, periodically telling us that she doesn't like children. Not that we know what beer is! Did I even spell it correctly? I don't know what it is so much that I probably don't even know how to spell it! Oh, and I even baked fresh bread for the occasion! I don't even know what happened. But it put 2013's Robitussin Pie to shame. And then we began the wait. And y'all. We had NINETEEN kids come trick-or-treating. And I don't even say kids! Well, and to be honest, we had 17 kids. Because two of them were straight up grownups. No. I'm not exaggerating and calling teenagers adults. There was a couple who was legit in their 30s, out trick-or-treating, with their dog. They had no children with them. But they were dressed up and they said "trick-or-treat" so whatever. Next year Lynne and I are going to knock every door in this town. How many kids did y'all get? Any grownups among them? I live in a country that doesn’t celebrate Halloween. The Americans still got together and did a trunk or treat. We invited coworkers who were not American. There were maybe twenty kids. My kids chose to give some of their candy to the six men who work in our neighborhood. We made them each a treat bag and handed them out trying to explain Halloween. A number of them said they knew what American Halloween was and that their Halloween was Wednesday instead of Tuesday. Then I tried to explain the difference between Halloween and All Saints Day, but my language skills weren’t up to the task. I’ve never seen our American candies in stores here though, so getting candy they’ve only seen in movies and tv shows was kind of cool. I wonder if Snickers lived up to the expectations. 1,249. I live in what's known as Halloween street. I can forward an email from the neighborhood watch guy who counts every year and you can see pics on my Facebook as proof. Do you even know what 1,249 kids looks like?! And some of them were clowns! And when we finally turned off our light at 9:15 we were exhausted but at 9:50 teenagers rang the doorbell and I yelled at them cause I had two sleeping kids including a baby... And I refused to give them candy! Thankfully they didn't egg my house. I'm now officially an old lady... And I think it means we got more than 1,249. Wow - you beat me - I only had a bit over 600 come to my house and I thought that was bad but you've doubled me! First of all, obviously some of us were here for the “alleged” child slapping grocery store incident. Did I use alleged right? I’m not a lawyer. Just an Internet Mom. But actually I would love help with controlling the kids during shopping, if you’re seriously offering. You know my babysitting story. I need help. Anyway, I jumped down to the comments to say thanks for the shout out about our book club, I was going to ask you to do that in pictures and distractions. I guess Mimi got to you first. She’s a go getter. Come read with us guys! I feel like I am going to need a secret handshake I can post so you all know this is the real Amy Rose when I have to use my anonymous profile. So glad you made a book club! How can I join it though? Are you already on Goodreads? If you are, simple. If not, still simple. Just make yourself an account (or log in) and click to join the group attached to the link Eli posted above. If that's still not working for you, we'll work it out. Good luck, and hope to see you on there soon! Ok so now I have gone back and read the actual post and not just your intro and we had snow on Halloween, is what we had. Our doorbell rang once, I didn’t answer. Then I dressed my kids up, put a bucket of candy in each bedroom and my husband and I in the rest and made my kids knock on the doors in our own home. Yeah, I’m that kind of mom. Come at me, Internet mom’s. You haven’t even heard my babysitting story yet. Yeah, this is Amy Rose. Can I get a nickname or something at least?! hahahahahaha How has that story not been shared in the family thread??? And Wow. I guess that's how you know you're not in upstate New York or Michigan, because you totally trick or treated in the snow when you were a kid. If you join the book club, please vote for our first book! Also, any more pictures of Duncan re-evaluating his life choices? I need more puppy dragons in my life. My mom dressed up her little dog as a unicorn. Life as a doggie mommy! I had forgotten your pie fiasco. Ha. 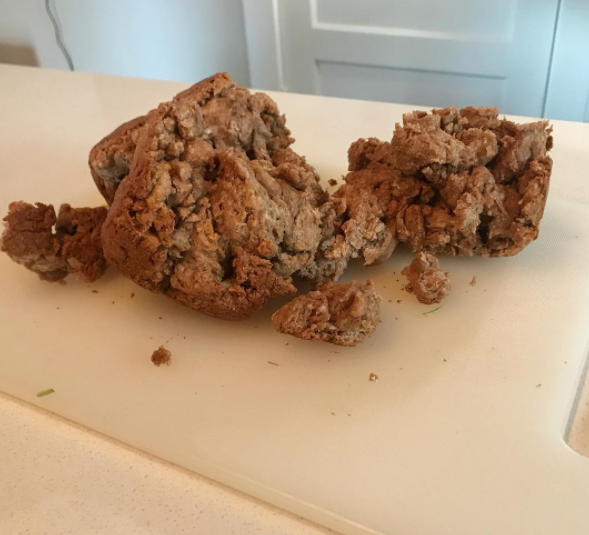 Did the bread still taste good, albeit in chunks? My apartment doesn't get kids so I wasn't even sure if kids still trick or treat door to door or if it's all trunk or treating in family members cars and going store to store in shopping malls these days (wait, do malls still exist?!). I did have to go to choir rehearsal during prime trick or treating time and I did see kids out and about though! Yay! Also: didn't you read our eleventy billion comments about how and when we discovered your blog?! Many of us were definitely around for your child slapping days. I had at least 150 kids come by during trick-or-treating. No grown-ups, though! I usually just sit out on my front steps with the bowl of candy and don't even bother to go back inside the house because there is no break in the flow of children coming down the street. I was all Halloweened out by the time the actual holiday rolled around, so I turned off all the lights in my house and sat at my computer editing photos from the Halloween parties I had attended over the weekend. To be fair, last year I only had 2 groups of kids ring my bell and then I ate a bowl of candy by myself while watching Practical Magic. I did not respect myself in the morning. 7. I bought 11 pounds of candy (gave some to 2 neighbors to pass out). The first 2 weren’t even dressed up. You should come to VA and pass out candy in my neighborhood. We pass out around 10lbs of candy every year. There are hundreds of kids. We are one of the very few neighborhoods out in the country, so parents hook up hay rides and basically trick-or-treat tractor pool to the neighborhood so their kids can run screaming door to door. It’s great! We had 10 kids total. 2, 2, and 6. No grown ups. (My husband tried to offer candy to the parents of the first kids, but they respectfully declined.) The last group came while my husband and I were watching a movie, and it took me a minute to get to the door because my husband was holding our sleeping baby, so I had to figure out how to pause the movie with the Playstation controller, and I grew up with a Nintendo 64, so I struggle. In the midst of this (and I promise it was less than 60 seconds, possibly less than 30), one of the kids yelled out, "We know you're in there! We can hear you!" And I very nearly didn't go to the door at all because that's rude. Learn some patience, kids! They were all polite and thanked me, though, so I guess they were ok. I have mixed feelings about this. I'm a little sad because this was our first year to have trick or treaters in awhile. The last three years we lived in an apartment complex that didn't allow trick or treating. On the other hand, I got a screaming deal on good candy at Target thanks to a saLe combined with coupons and Cartwheel, so now we get to enjoy all the yummy Snickers, Reese's, peanut M&Ms, etc. I once only had 9-15 kids the first 2 years I had moved into my new home. No one came down my long road/circle. So I took matters into my own hands. 2010 I announced on my neighborhood Facebook page to make store everyone had their kids come down my street. And they did, and they weren’t disappointed. And it’s only grown each year since then. This year was my biggest. Here’s what we did: we made headstones, fried scones, dusted them in cinnamon and sugar, and powdered sugar, and had hot chocolate for all our visitors, served out of our garage that we decorated so it no longer looked like a garage. We hang Black tables cloths over all the walls, and festive Halloween lights. Each year we’ve added something new. A headless horseman silhouette, 2 years ago we added a movie, with bales of straw for everyone to sit on and watch the cartoon version of Ichabod Crane and have their acone and hot chocolate. This year we changed the theme, It’s The Great Pumpkin Charlie Brown, with painted decorations on the lawn, ghost trick or treaters to resemble Charlie and his friends. I went through over 6 gallons of hot chocolate and over 200 scones. It’s for parents too, not just the kids. And that is how my husband and I brought Halloween back to Inca Circle! Ames, my mother-in-law does something similar. When Jeff was a kid, the street ended at the house after them, so not many people found it worth the while to go all the way down. So she started throwing an open party in her garage. The kids only got candy, and all the food was available to parents. When Jeff, his brothers, and the neighbor kids got to old to trick or treat, they started building haunted houses for the kids to go through. I have a feeling that KRo is a dirty little fun haver. I like your style KRo. Ditto. One of my favorite Halloween memories is that once I was in high school and stopped trick or treating, I would sit on our front porch and hand out candy instead of my parents. 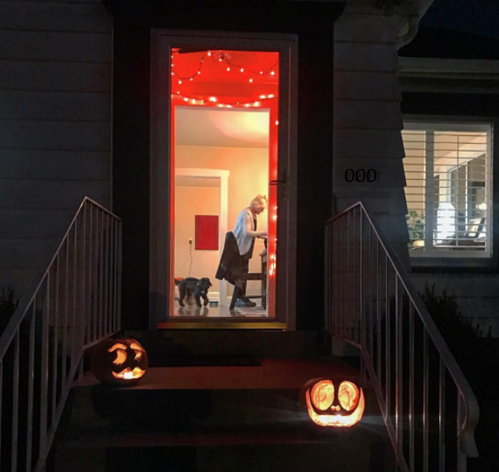 Inside the house, my mom would dress up, sneak out the back, and trick or treat a few houses on the street to "look natural" and then try to get candy from me without me recognizing her. One year she covered herself with purple balloons and went as a bunch of grapes. (My mom is just shy of 5'4", so she's short enough to blend in with the crowd.) Aw, now I miss my mom. Michelle--That is the most adorable thing I've heard all week. And heard Duncan bark just this morning. How is your house number 000?!?! LOL... I didn't even notice that! I would be scared to go to the creepy 000 house. When I was very young, cereal boxes sometimes had a floppy vinyl record inside (or on the box, or something)...so, once it was a scary story on the record...Something about aliens communicating through the t.v., on channel one-- "BUT THERE **IS** NO CHANNEL ONE!" hahaha! That's what his house number made me think of. I 35 years later, I'm still traumatized, apparently. I got O trick-or-treaters. As I was getting home from work I saw a family going door to door in the building across from mine. I ran to my apartment and dumped three bags of candy into the bowl...and waited...then waited some more. Finally realized they were just going to skip my building with the nice pumpkin and door decorations on it. Jerkfaces. A) Eli you can hit my kid in the grocery store, movie theater, parking lot, McDonald's, or anywhere else if you see him getting out of line. In fact - beat him senseless with a blunt object. I don't mind. B) Yay bookclub - I'm super excited about this! My husband won't be because it means I'm buying more books but he just paid $30 for the Clint Eastwood collection on iTunes so he can live with it. C) We had a bit over 600 kids come. Yes - a few were adults but mostly kids. I thought for a second that bread was another dog. We had 11 kids total, and the doorbell only rang 3 times. The last time was 2 boys, roughly 15 years old, wearing nothing but basketball shorts. In Michigan.